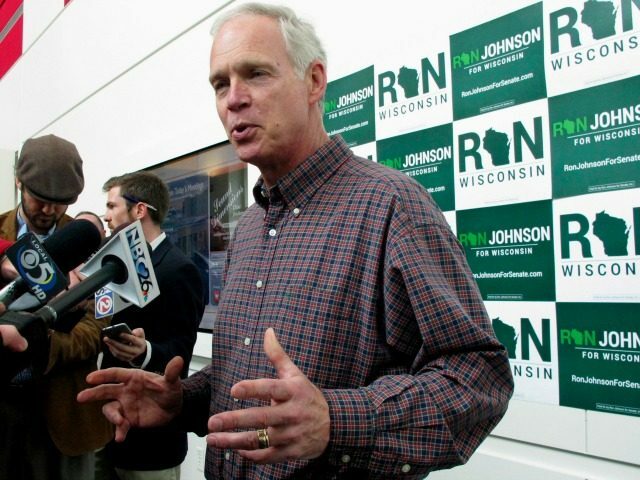 The American replacement bill is needed because companies can’t hire the employees they want amid the massive decline in the number of Americans who are seeking work, Wisconsin Sen. Ron Johnson told an event hosted Wednesday by the CATO Institute. You got to ask those hard questions… it is not going to be a government program that is going to solve that [worker decline], but smart government policy, things like the bill we’re going to be introducing with the help of CATO today … is a really good direction to move. Give a it a shot. Let’s see how much better the states do. My guess is that they will do a whole lot better than a one-size-fits-all federal [foreign worker] program. The bill would allow states to each get 5,000 visas for additional foreign workers per year, plus a population-based share of another 245,000 visas, plus a share of any visas not used by other states. The inflow of foreign workers would start at 495,000 in the first year, not counting the additional family members of each imported worker. The bill would also create an amnesty, because the visas could be given to 11 million plus illegals living in the United States, including those who returned to the United States after being deported. The acknowledgment came at the end of his statement when he thanked the CATO group and his House counterpart, Colorado GOP Rep. Ken Buck, for backing the replacement bill. “Let’s face it, to have the courage… we’re probably a lightning rod on this bill,” Johnsson said in his videotaped speech. In November 2016, Donald Trump won the presidency partly because many blue-collar Americans — including many in Wisconsin — oppose the economic impact of cheap-labor immigration. In January, Trump emphasized that his administration’s mantra is “Buy American, Hire American.” Since then, he has sharply reduced illegal immigration and has proposed popular plans to reform legal immigration and the contract-worker programs. The collapse in work rates for U.S. adults between 2008 and 2010 was roughly twice the amplitude of what had previously been the country’s worst postwar recession, back in the early 1980s. In that previous steep recession, it took America five years to re-attain the adult work rates recorded at the start of 1980. This time, the U.S. job market has as yet, in early 2017, scarcely begun to claw its way back up to the work rates of 2007—much less back to the work rates from early 2000 … U.S. adult work rates never recovered entirely from the recession of 2001—much less the crash of ’08. The subsequent “social pathologies … I would argue are being driven by government policy,” Johnson told the hearing room, and he cited Medicaid’s distribution of free opioids throughout much of the country. I think we’ve got to deal with able-bodied individuals in this country who are not working … we still need to address the feeling among Americans that are workers in the country… who are not working and need to be working. Both Buck and Johnson are former business executives. The Buck-Johnson replacement bill would amplify the federal government’s employee importation policies. Under current law, the federal government annually imports roughly 1 million legal immigrants plus 1 million contract workers, such as H-1B therapists and professors. The immigrants and contract workers do grow the economy — but they also compete for jobs against each year’s cohort of 4 million American high school and college graduates. The flow of cheap immigrant labor has many effects. It does expand the consumer economy as it also shifts $500 billion from employees to employers and Wall Street, and it amps up state and local government spending by $60 billion a year. It also reduces the incentive for employers to recruit disengaged Americans or to build new facilities in high-unemployment areas, reduces businesses’ demands on schools to rebuild vocational training departments, and reduces business investment in labor-saving technology. Nationwide, roughly 10 percent of American “prime age” men, or 7 million men aged 25 to 54, have stayed out of the nation’s workforce of 160 million amid the glut of cheap immigrant labor and the resulting low wage rates. Many working-age Americans are not trying to get jobs, and are not participating in the nation’s labor force, largely because of low wage rates, according to an August statement by Jason Furman, the chief economic advisor to former President Barack Obama. That huge population of non-working rural Americans is a major part of the opioid epidemic. In 2014, roughly 47,000 in the U.S. died from drug overdoses, especially from heroin and other opiates. Heroin overdose deaths more than tripled between 2010 and 2015. Johnson said the bill would allow the additional incoming workers — and their families — to get the hugely valuable prize of citizenship after several years of work. But that offer of citizenship creates a compelling incentive for companies to discriminate against Americans by hiring the foreigners eager to work long hours at low pay for the future reward of citizenship. The prize of citizenship already acts as a government-provided deferred bonus for many foreign contract workers, such as H-1B white-collar professionals, who compliantly work long hours at low pay for several years in the hope of getting citizenship. In contrast, Americans can only get paid from companies’ pre-profit accounts, so companies have an incentive to hire foreign workers by offering them the citizenship bonus that is paid by government and taxpayers. The Johnson-Buck replacement legislation is backed by the self-described libertarian CATO Institute, even though the legislation would give state legislatures huge power over the life or death of many companies. For example, the legislation would give the state government the power to provide at least 5,000 low-wage workers each year to company executives who cooperate with state political leaders. It would also give the state politicians the power to ruin executives by suddenly withdrawing the imported workers from companies who disagree with the preferences of state politicians.